Hello! How are you? Today I am going to give you my opinion of the The Ordinary Hyaluronic Acid 2% + B5 serum. I believe that serums are some of the most difficult to choose products, finding the right one is an adventure full of unknowns (there are even some who still wonder if they really need it). Today I want to help you solve that problem, do you dare? 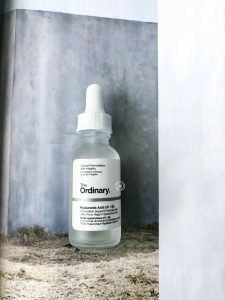 You can get the serum The Ordinary Hyaluronic Acid 2% + B5 on DECIEM (UK), Beauty Bay (UK), and on The Hut (US & Canada). Those who know me better know that The Ordinary is one of my reference brands. Since the birth of DECIEM in 2013, they have become one of the biggest players in skincare worldwide. Some time ago I decided to try their products and I’m in love ever since. In this post I told you about their Vitamin C Suspension 23% + HA Spheres 2% and in this one about the EUK 134 0.1%, both also from The Ordinary, so if you want to know a little better about their range of skincare products do not hesitate to have a look. After discovering a couple of products of the brand I decided to incorporate one of their serums into my beauty routines, and when I tried the Hyaluronic Acid 2% + B5 I discovered that it is a perfect addition to my daily skincare routines. I’ve been using it for a while in my night routines and I’m really delighted. I feel that it gives me some necessary extra nutrition. It shook me that many men do not even consider using a daily serum, and I want to do something to change that. In some cases this situation is not reduced to the simple use of the serum, there are those who do not have a well-defined routine in which to properly cleanse and hydrate the skin, which may end up leading to a more aged appearance and, much more important, a deterioration of dermatological health. On previous occasions I have claimed the importance of carrying out a strict daily routine of skin care. And no, it does not matter if you get home late or you have the worst hangover of your life, daily means daily. Cleansing the skin (with a cleanser and then with a toner) is essential to remove excess oil, dead skin and other particles that are deposited on it throughout the day, clogging the pores and damaging your pH balance. If afterwards we do not apply a serum frequently, the use of a moisturizer (which seems to be the most used product among those who speak to me about these issues) is much less effective, so it is important to incorporate it into our daily routines. The serum differs from the moisturizer in that it is lighter, so it reaches more easily the deeper layers of the skin and gives us some much needed nutrition. Without further ado, I will start with the review once and tell you my impressions about The Ordinary Hyaluronic Acid 2% + B5 serum. First you can see that it is transparent (a little white-ish) and very, very thick, especially for a product that is applied with a dropper. It has no recognizable smell, at least for me. When it is spread on the skin it leaves a first feeling a little unpleasant, it is dense and sticky and it seems to dirt the skin, although it is not like that. However, after a few seconds that feeling disappears and the skin is perfectly smooth, ready to apply the boosters and moisturizer. This serum contains, among other ingredients, hyaluronic acid, with known anti-aging properties, capable of supporting up to 1000 times its weight in water to provide deep hydration at different levels and vitamin B5, with moisturizing and repairing properties. This serum does not contain fragrance. The aesthetics of packaging corresponds to the brand’s usual style. First we find a cardboard box. Inside we find the usual container with dropper The Ordinary, in this case made of translucent glass. The dropper applicator is especially useful when applying this serum, since only three or four drops are enough to spread it all over the face. It is convenient to extend it quickly, because otherwise, given its texture, it can be more difficult. I loved discovering this serum. Just when I was looking for a new one to incorporate into my daily routines I have found this one. I really like the result it gives, leaving my skin prepared and loaded with nutrients before applying the moisturizer. Perhaps what I like the least is the texture, as I have mentioned. I have tried other serums (of which I will talk later) and, with the same thickness, get a much more pleasant result. In any case, I recommend it completely. You already know that the serum should be used after the cleanser and toner to provide your skin with all the nutrients it needs after cleansing it thoroughly. Then you only have to apply the boosters that you want to use that day and finish with your favorite moisturizer. I use this serum in my night routines, but if you want to apply it during the day you should always remember to apply a good sunscreen at the end of your beauty routine. And to you, what is the serum that you like the most? You already know that if you want me to try a specific product or have any questions you can leave me a comment and I will respond immediately. REVIEW: The Ordinary Vitamin C Suspension 23% + HA Spheres 2%. REVIEW: The Ordinary Matrixyl 10% + HA.